When bears come into a residential area they are usually looking for food. Bears like to eat many of the same foods we enjoy, so we need to be careful about how we handle food and food waste to minimize the odours that attract bears. 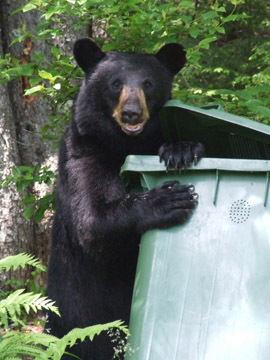 When a bear smells food odours coming from a green cart, garbage container, or even a barbecue, the bear regards this as a convenient source of food and it will return to the site again and again. Not only is this annoying for us, it means the bear will become dependent on people for food and may become invasive and destructive.